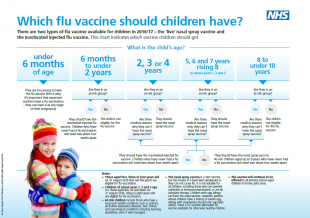 Flu is a common infection in babies and children and can be very unpleasant for them. Children under the age of five have the highest hospital admission rates for flu compared to other age groups. For many years the flu vaccine has been offered to those who are most at risk of severe illness from flu. This includes pregnant women, those aged 65 and over, and those with long term health conditions, including children.